Please note - you cannot purchase from this site. Prices shown are RRP. Contact us for pricing. Any product outside of our standard choice of material/size range starts with a 5. This may include items such as rolls of tape, sign frames, floor graphics or banners. Below you can find a more detailed description of the miscellaneous material options available for this sign design. Multi-message signs provide multiple safety messages on one sign. This sign warns of the hazard and mandatory/prohibition action to be taken due to asbestos. 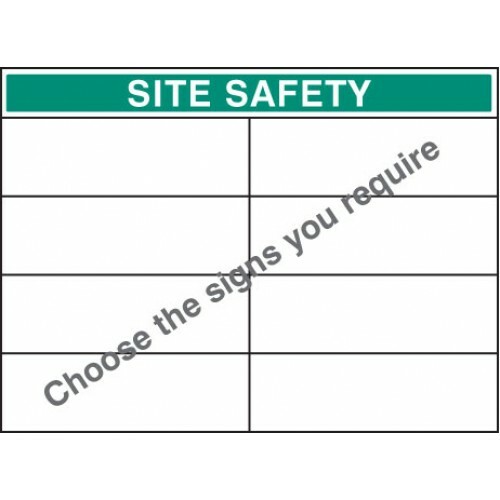 You can write contact details in the space..
Site safety sign to identify what PPE is required to be worn on site. Miscellaneous Products / MaterialsAny product outside of our standard choice of material/size range starts with a 5. This may inc..
Our safety sign products are constantly being improved and updated and as a result we reserve the right to alter or amend our products. All product sizes are subject to normal commercial tolerances and are shown in nominal form. Wherever possible, all safety signs shown on this website have been amended to display a technically correct ISO 7010 symbol. We pride ourselves on having the most comprehensive health and safety sign range on the market, but we do appreciate that every workplace has different signage needs. With this in mind we offer "Standard Specials". Choose either a prohibition, warning or mandatory safety sign (available in a range of materials and sizes) send us details of the symbol and text you wish to use and we'll create your required safety sign.